Amun ’s consort at Thebes was Mut Goddess, whose name means “mother.” She was considered a great world mother who conceived all things and brought them into existence. 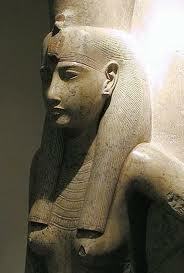 She was usually drawn in the form of a woman, and she wore the double crown of Upper and Lower Egypt. In her hands she held a papyrus scepter and an ankh. Mut Goddess was associated with the vulture, which indicated that she was a protective goddess; and the hieroglyphics for her name contained this bird. Often the vulture sits on her head under the double crown, but in the Book of Dead there is a drawing that probably represents Mut Goddess in which she stands with arms outstretched and covered with vulture’s wings. Beside her head are the heads of two vultures. The same chapter of the Book of the Dead associated her with dwarves, and it was said that she made souls and bodies strong and delivered them “from the abode of the fiends that is in the evil chamber.” She was also identified with Maat, and in some representations she was shown standing beside Maat’s plume. The best-known seat of worship for Mut Goddess was her own temple at Karnak. Built about 1450 B.C. by Amenhotep III, this small temple today is in ruins, but at one time it was constructed around two inner courtyards, packed with over six hundred black granite statues of the goddess Sekhmet, and it was here that Ptah’s consort from Memphis was associated with her Theban counterpart. There were other shrines to Mut Goddess from Upper Egypt.